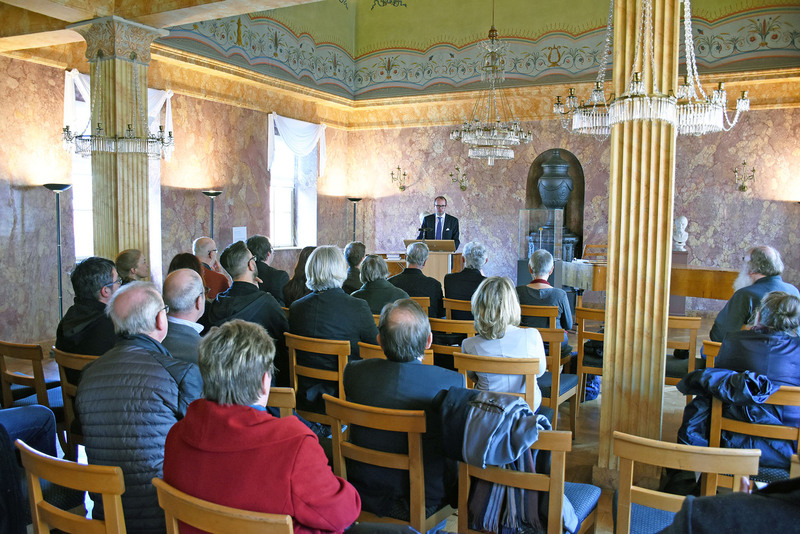 On March 8, 2019, a celebration took place at the Klassik Stiftung Weimar. There, a 1687 gold coin, only one single specimen of which is known to exist, was the center of attention. 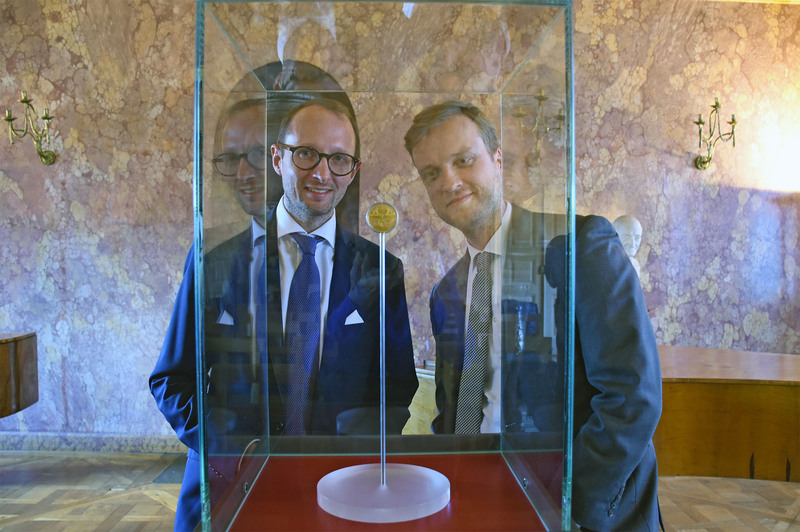 The off-metal strike in gold of the Alchemistentaler of Frederick I. of Saxe-Gotha-Altenburg from 1687 was officially returned to representatives of the Klassik Stiftung Weimar by Ulrich Künker, Executive Director of the Osnabrück-based auction house Künker. A valuable record of Weimar’s history thus returns to its place of origin after it had been carried off to the United States after the Second World War. 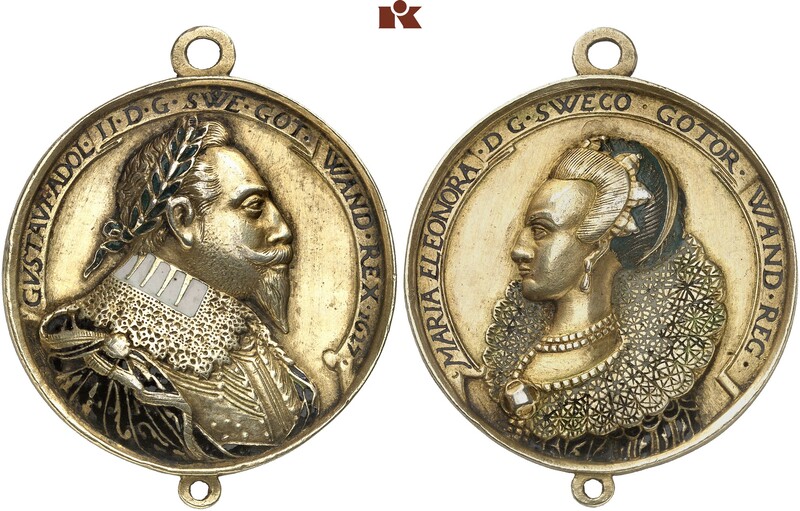 The restituted object - Künker Auction Sale #302, Lot number 1211 (February 1st, 2018): Saxe-Gotha-Altenburg. Frederick I, 1675-1680-1691. 6 ducats 1687, Gotha. Die by Christian Wermuth. FRIDERIC D G DVX SAX I C ET MONT Laurel-crowned head facing right, below signature I G W. Reverse: A NUMINE LUMEN SUSCIPIO ET REDDO ( = from God I received the light and I return it), in between Got[ha] 1687. Above a bank of clouds, between the sun (= gold) and moon (silver) the hexagram (= the unification of all elements and the philosopher’s stone), which redirects its bundled rays onto the alchemic eagle (= the process of vaporization); the eagle holds a uroboros (= eternity and the symbol of Materia prima, the starting products) it its beak which entwines the alchemic symbols for salt, sulfur and mercury. Steguweit 137 (as 10 ducat and fine silver taler). The restituted coin is an off-metal strike in gold, weighing 6 grams, of a taler that is known in numismatics as the “Alchemistentaler”. Frederick I. of Saxe-Gotha-Altenburg had the piece minted at the Gotha mint in 1687. It visualizes the duke’s love of alchemy. Frederick owned an alchemic laboratory at Friedenstein Castle. He spent a lot of money on alchemists and their formulas in order to find a way to cover public expenses with “chemical” gold. The notes Frederick took of his alchemic experiments have been preserved at the state archives of Thüringen in Gotha. While we might want to laugh about such dreams, our modern-day chemistry did in fact develop from Baroque alchemy. Numerous alchemic symbols on the reverse of the Alchemistentaler make reference to the conversion of base metals into precious metals: through the process of vaporization, the starting products salt, sulfur, and mercury are turned into the end products gold and silver with the aid of the philosopher’s stone. In the Baroque age, it was common to exchange gifts with related, acquainted and allied princely courts. Gold multiples that represented the preferences and interests of the gift-givers were particularly popular presents, such as the 6 ducat returned by Künker. Which is why it is likely that Frederick I of Saxe-Gotha-Altenburg gave said piece to William Ernest of Saxe-Weimar as a gift himself, and that this is how it ended up in the coin collection of Weimar. After the Second World War, the coin was stolen from Weimar in 1945 – along with a total of 200 other numismatic items. A large part of the robbed items, including the piece in question, were provably sold by the auction house Grunthal & Ganz in New York in 1950. Ever since then, it had been part of a private collection, until it was consigned through the auction house Künker in 2017. Its possible provenance was first researched and Gotha was asked if the piece might have been part of their collection and whether or not it might have gone missing. As this was not the case, the coin was then auctioned off as lot 1211 in Künker’s Berlin Auction on February 1, 2018 and sold for 28,000 euros. 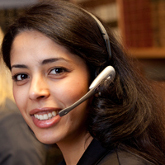 The sales price, including buyer’s premium and VAT, amounted to 34,400 euros. Only after the sale, but before the delivery to the buyer, the suspicion was raised that the coin might have been stolen from the Weimar collection. Künker immediately stopped all further delivery operations in order to irrefutably resolve this case. After the suspicion had proven to be true, Künker’s executives decided to restitute this significant piece of historical importance. Dr. Sebastian Dohe (r.), custodian of art and artisan craftwork until 1650, Klassik Stiftung Weimar is excited about the addition to the collection, passed by Ulrich Künker (l.). Regarding his motives behind procuring the five-digit amount, Ulrich Künker added: “I am one of the most fervent critics of the German cultural property law that was passed in 2016. I criticize that it puts all dealers under general suspicion of only being interested in profit. That is not true. We as dealers accept our societal responsibility. The return of this piece is just one of many pieces of evidence for that. There is a long tradition of a generous approach to public coin cabinets among coin enthusiasts: dealers and collectors have always primarily cared about promoting numismatics as a field of research. In this regard, there have never been any reservations between collectors, dealers and curators, but instead it has always been a close cooperation. This cooperation was threatened by the introduction of the new law. The law’s supporters have actively attempted to drive a wedge between the representatives of public collections and private collectors as well as dealers. In a sense, this return should be considered a symbol: We will not be driven apart. This restitution costs a lot of money. But we gladly spent it for this good cause. I hope this gold Alchemistentaler receives the well-deserved attention of an interested public audience it deserves in its old and new home. Ulrich Künker, Executive of the auction house Künker / Osnabrück speaks in front of a classical backdrop in celebration of the official return of the golden Alchemistentaler in Weimar.